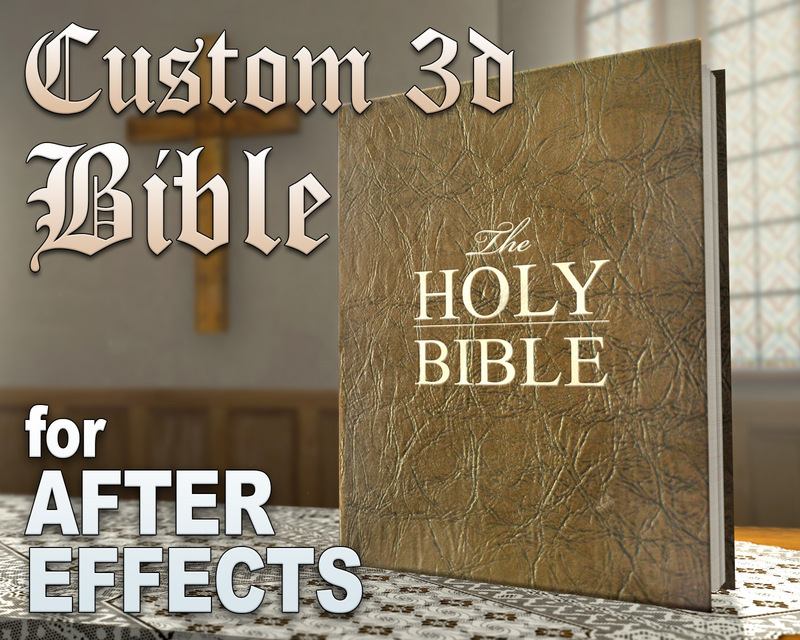 Watch the Demo Video for Custom 3D Bible. This Custom 3D Bible After Effects template allows you to create your own realistic bible animation - perfect for displaying a specific verse or passage. You can fill the pages of the bible with your own content, and turn through the cover and pages on demand. Choose from multiple camera movements, and choose from two 3D rooms to place the book in (a sunroom or church). For editors in a hurry, there are two finished comps (see first two animations of the preview video), which have the bible opening to reveal a verse. Simply edit the verse text in these comps and then export. The template comes with a library of images, including paper and cover textures, vintage design elements from the public domain, and Christian artwork. You can use these images to help design your pages, but there is also a number of pre-made designs that you can use and customize. Some of these designs are more art-oriented, and some are simply text/Scripture, formatted in different ways to give you options for how your pages look. The bible can be moved, rotated, resized with different height, width, or spine thickness. You can adjust the bend of pages, make it hardcover or paperback, add or delete pages as needed. Convenient slider controls allow for easy customization of your book and the 3d scene. Edit your camera animation to create completely unique animations. A 3D Storybook and 3D Wedding Album are also available at the following link: Custom 3D Books. Music is not included. Compatible with CS5 and up.Comps are 1920x1080. No plugins required.